We are open 7 days a week from 10:00 am to 7:00 PM. YES, WE are Open on Sundays. 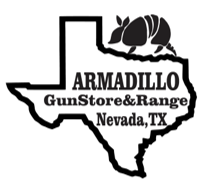 Armadillo Gun Store and Range is located in Nevada Texas. We are on CR 489, Near Lake Lavon, before you get to the power station. We are a privately owned range. We have been in Nevada since 2008. Nevada’s only outdoor gun range is open!! We are proud of our facility and what we offer to our customers. The 16 individual pistol lanes have fantastic lighting designed by Mother Nature for the best shooting experience. We have target retrieval system so you can see how well you shot! Additionally, we have 5 fifty yard rifle lanes and 5 one hundred yard rifle lanes so you can practice your long rifle shots for hunting season or just zeroing in your rifle. We have competitions monthly to provide a competitive yet friendly environment to test your skills against other shooters. Safety equipment is available for purchase. We offer a variety of handguns you can rent before making a purchase decision. We are here to help.